It is quite funny to think that for recognizing the cirl bunting from its song, we have to talk about cheese but an old Anglo-Saxon ornithological tradition that uses to transform the vocalization of every bird in a complete sentence, has given the cue to the passionate enthusiasts of the winged world of this country for a stratagem that at times may reveal useful. The buntings have for the inexpert, a song more or less similar between them and in some parts of the singing phrases some even more similar than others. The Yellowhammer (Emberiza citrinella) is rightly the congener with whom more reference is made for the resemblance as well as for the song. It is so that the song of this bird that has been reproduced faithfully with the phrase “a little piece of bread and no cheese” is used also for the cirl bunting and in some and occasional musical phrase but ignoring the final part of the song, rightly “cheese”, as its melody limits to the first part. The Cirl bunting (Emberiza cirlus Linnaeus, 1766) belongs to the order of the Passeriformes and to the family of the Emberizidae and is one of the most reserved and shy Mediterranean buntings. In contempt to its common name of black, this bird is instead endowed of a coloured and elaborated relegating perhaps the term black to its reluctance in showing in full light, staying always at a safe distance from the observer who perhaps saw it as a dark small bird in its whole without distinguishing the details. As is the habit of the buntings, the male loves very much to stay on top of shrubs or small trees to spread its territorial song or for calling the female, conversely the cirl bunting is the one who more of the others choses usually the higher tops of the trees or also electrical poles but is also the most rapid in escaping from a considerable distance as soon as it sees intruders approaching. Further proof of this discretion is the poor popular knowledge that reflects practically with the absence of common names specific for this small bird. Whilst in Italy the Ortolan bunting, or Ortolan (Emberiza hortulana), the Rock bunting (Emberiza cia) and the Corn bunting (Emberiza calandra) have various local dialect names, the cirl bunting is highly deficient in them and when referred here appears the usual and generic name of “zigolo”, indifferently used also for the other congeners. On the other hand, the origin of the Italian common name of “zigolo” is onomatopoeic from “zìvolo”. It’s fun then to find out that the origin of the scientific name of the species, cirlus, comes rightly from an old vulgar Italian term, more in particular of the Tuscan dialect, an imaginative and quite sympathetic idiom to tamper terms that do have a meaning in the name, as if the variation should strengthen the meaning of the word. In this instance, “cirlo” originated by the onomatopoeic “zirlo”, the particular squeak this bird emits when troubled and used, more clearly, for the Song thrush (Turdus philomelos). 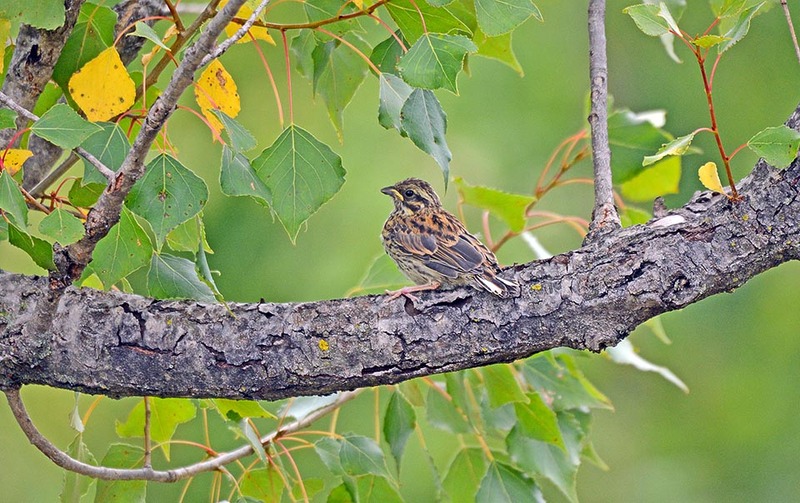 The etymology of the genus Emberiza, comes from the old German embritz, a way for usually calling all buntings. 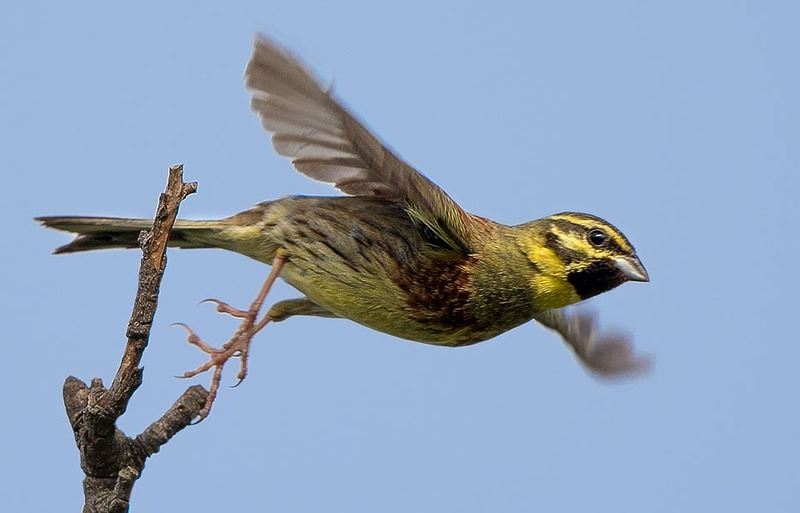 In Europe, it is called Cirl Bunting in English, Zaunammer in German, Escribano soteño in Spanish, Bruant zizied in French, Escrevedeira-de-garganta-preta in Portuguese and Zigolo nero in Italian. As customary in most buntings, also the cirl bunting has a very limited range, restricted in its vastity and specialized in the habitat. 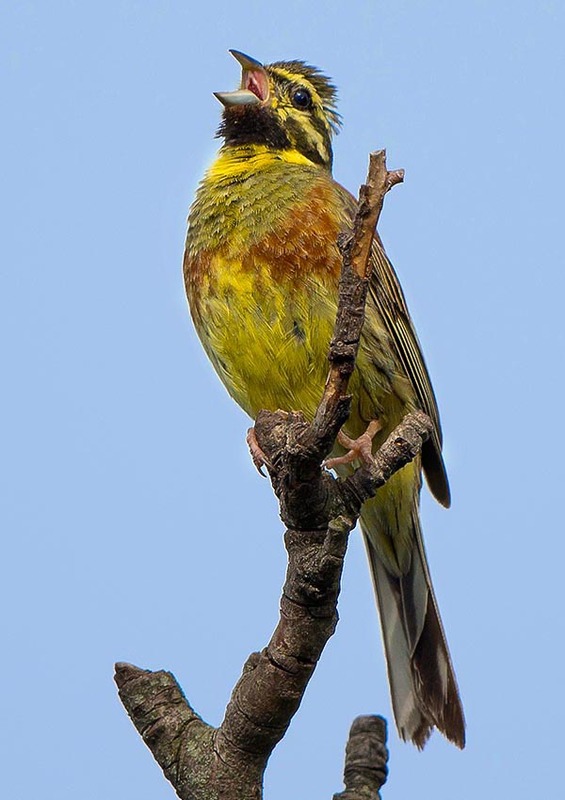 The cirl bunting is a bird of the warm, Mediterranean climates, with sunny summers particularly dry and arid, and winters relatively mild usually poorly subject to snow cover. This territory guarantees this bird the possibility to stay all year long rendering it practically sedentary in most of its range. It occupies all coastal regions from Portugal to Turkey, France and partially south-western part of Germany. It is totally absent in central and northern Europe but the Balkan Peninsula and isolated colonies in southern Great Britain. It is also present in north-western Africa on a coastal line including Morocco and Algeria. It does not live in the highest mountain systems even if it frequents the hilly zones where it is often very frequent and from where during the winter migrates in altitude getting down to the underlying valleys. As previously stated, the species is sedentary but subject to short range erratic movements depending on the weather conditions, therefore these movements are often very short in distance and at times, in favorable climate periods, are even inexistent. Such a limited territory, with so close populations in an almost uniform habitat, could generate only quite a few subspecies. In fact, only two subspecies have been classified, one, Emberiza cirlus cirlus living in all the continental European territory and the other, Emberiza cirlus nigrostriata, in Corsica and in Sardinia. 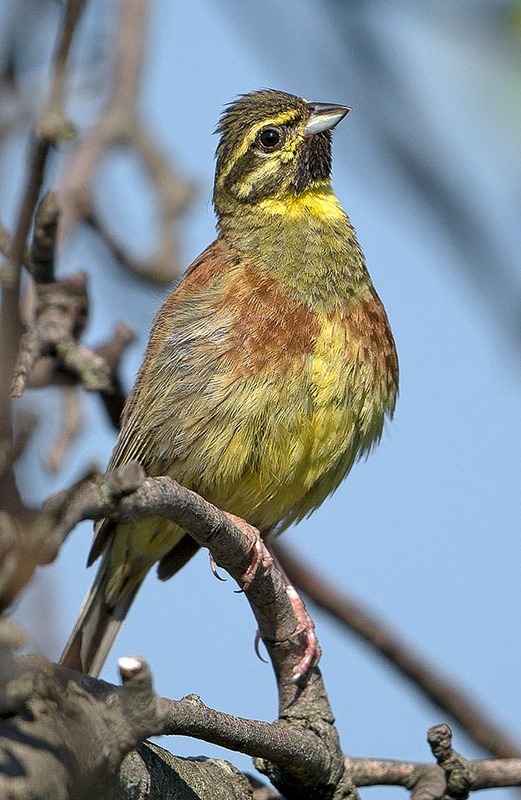 The cirl bunting is quite demanding and specialized in the choice of the type of habitat and it is unlikely to be found in different habitats. It loves warm and dry climates, hilly and mid-mountain, well sunny, fields with small thickets or rows of trees, bushy lands and pastures, vineyards. On the Mediterranean coasts it frequents also olive groves and slopes with sparse bushes. Also banks and dried and stony clearings of the rivers, carefully avoiding areas cultivated or subject to agricultural operations. Has no fear of man with whom often cohabits even if keeping cleverly in the shade and passing unobserved especially during the nesting. It is not rare, in the morning, to find it suddenly in that poorly frequented corner of the garden, on top of a small tree while emitting its penetrating and repetitive squeak and then, after some time, to see some small sparrows, as they look like those, disorderly fluttering out from the nearby privet hedge. The cirl bunting is an elegant small bird quite similar to many congeners for the size as well as for most of its livery. It has an average length of 17 cm, a weight of about 22 g and a wingspan of 26 cm, measures that often vary depending on the season and the zone where they come from. The cirl buntings are typical small sparrows more coloured than usual, with similar social habits in particular seasons, with analogous behaviors and equal feeding. Moreover, the female that in the buntings has usually a faded livery, besides being easy to mistake with that of the House sparrow (Passer domesticus), can be mistaken among its same congeners in a so much marked way in some species, to render them little identifiable on the field. However, the species is well discernable for the song that is different even among the same buntings and for the colours of the livery of the male, often very striking. The cirl bounting has a general orange brown mottling on the alar cover, with clear evidence of the dark light barbs of the remiges and the primary coverts. A very variegated and very elegant colouration that recurs up to the rump that is markedly more reddish. The tail, particularly forked as all buntings, is brown with the outer remiges with white barbs well visible when flying. The colouration of the head is the determinant part for distinguishing this species from the congeners. Very similar to that of the Yellowhammer (Emberiza citrinella) that as the name states is completely of this colour, is however streaked with black with a superciliary that from the beak gets to the nape and a triangular small gag, black too, limited to the chinstrap. On the top is present a cream and black grizzled hood that goes down on the nape to interlock with the back. The presence of these black stripes on a bright yellow background, has suggested the common name given in Italy to this bird. On the neck it has a narrow yellow collar delimiting a wide olive belt that becomes, while going down to the chest, a mottling mixed of yellow, ochre and orange gently dotted of black. A variegated and multi-coloured palette, visible only from near and in full light. The beak is pearly black, the eyes are very dark and the legs fleshy pink. The female is almost totally missing of this brightness of colour and is uniformely more ochre yellow brownish. The young are well distinguishable due to the very marked yellowish labial commissure and due to the colours of the livery which are rather faded and little evident. 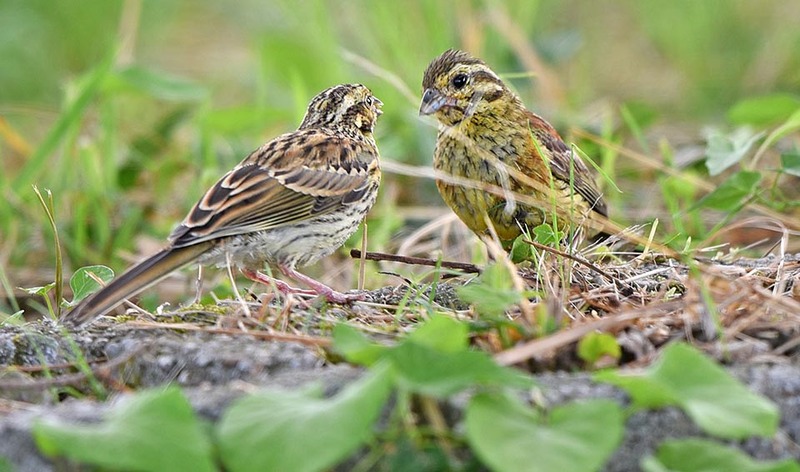 The cirl bunting is monogamous during the reproductive season and is very territorial during the nesting period, however some couples develop scattered colonies that see nestings at a few tens of metres far from other nests. The construction of the nest is entrusted to the female who, after having dug a slight depression on the ground, takes there dry grass blades and rootlets that interweaves to form a deep and well formed cup. The nest is very well camouflaged among the grass or at the base of low shrubs and is practically invisible from above because hidden by a drooping tuft of grass. 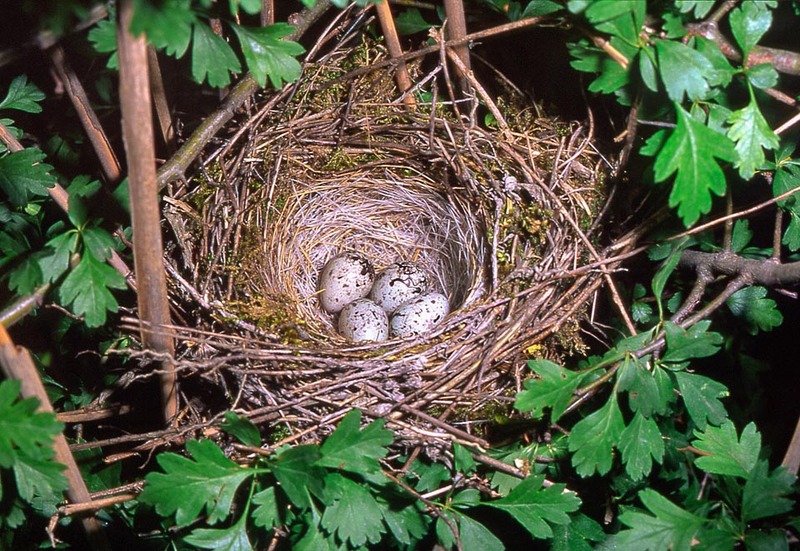 It is not rare that the nest is placed raised from the ground, between the small branches of a thick bush or even on a climbing ivy but always at very reduced heights from the ground and, exceptionally, up to two metres of height. Are laid 4 or 5 eggs softly coloured by a slight bluish green shade and beautifully stained with black lines and marks. The eggs of the cirl buntings are small masterpiece, tiny paintings with abstract designs never similar to each other and the cirl bunting keeps this tradition. The hatching lasts about two weeks and the newborns that come to life blind and featherless remain in the nest for about 15 days before taking off, always lovingly cared by both parents. Usually it lays two broods per year. 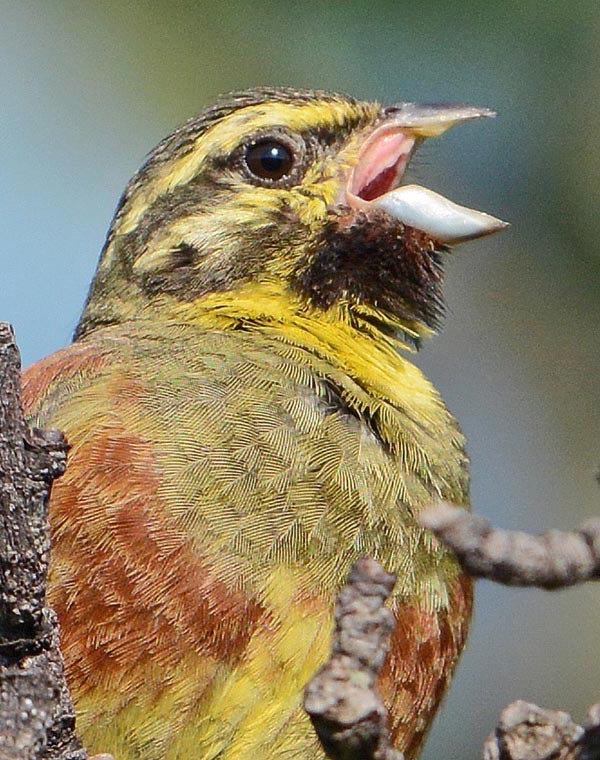 The cirl bunting is a granivorous bird during the winter and the strong and toothed beak proves it but the summer diet is based on invertebrates, in particular grasshoppers but also caterpillars and chrysalides, foods that are essential for the growth of the progeny.